Henry V was the warrior king whose reputation his unfortunate son never could live up to, and against whom Henry VIII would allegedly measure himself, but he wasn´t born an heir to the throne. Instead his cousin once removed, Richard II, was on the throne, and Henry himself was quite far from succession. Due to his “insignificance” in the succession line, the date of his birth was never officially recorded, but set as August 9, 1386. 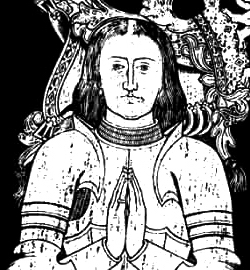 He was born in the gatehouse of Monmouth Castle in Wales – a fact that has led to him sometimes being referred to as Henry of Monmouth – the first child of a 20-year-old Henry of Bolingbrook and 16-year-old Mary de Bohun. 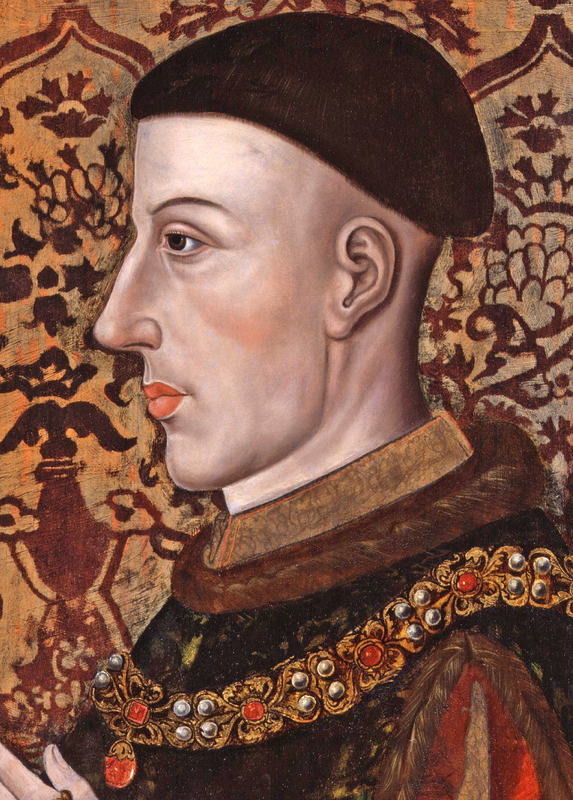 When Henry was 12 years old, in 1498, his father who had a tumultuous relationship to Richard II was banished from the country by the king, but the younger Henry himself was taken under the wings of the king, but only a year later the Lancastrian usurpation brought his own father to the throne, and suddenly Henry of Monmouth was the heir to the throne. Henry has, with the aid of Shakespeare, received a rumour of having been a carefree and irresponsible youth, more interested in drinking and cavorting with a merry band of similar minded men, but nothing in actual history suggest this to be true. His father soon put him to what would have been considered good use as commander of part of the English forces, and as such he led his army against Owain Glyndwr in Wales as well as joined his father in the battle of Shrewsbury against Henry Percy, also known as Harry Hotspur, in 1403 when the future Henry V was only 16 years old. This battle could have been the end of the future king as he is said to have been shot in the face by an arrow which got lodged and had to be removed surgically. The wound was treated with honey for its antiseptic qualities and flushed out with alcohol, healing but leaving a scar that no doubt would have kept this day in the memory of Henry for the remainder of his life. Henry IV started suffering from poor health at the beginning of the 15th century, resulting in the prince in practical control over the government from 1410, something that changed in 1411, due to disagreement between father and son on both domestic and foreign policies. This was only a political disagreement, but may very well be on what Shakespeare built the conflict in his play. Henry IV died on March 20, 1413 and prince Hal was crowned Henry V just over two weeks later, on April 9, at Westminster Abbey. Henry´s reign at home was relatively free from trouble, but he had a couple of occasions to demonstrate that he was not to be crossed, such as the execution of his old friend, the Lollard sympathizer John Oldcastle (believed to be one of at least two people merged into Shakespeare´s Falstaff, originally called Oldcastle) as well as the handling of the men behind the alleged Southampton Plot. What Henry primarily have come to be remembered for are his campaigns in France, starting in 1415, when he sailed from England on August 12 after which his forces besieged the fortress at Harfleur, finally taking it on September 22. Henry then decided to lead his men to Calais, and it was on the way there they were intercepted by a French army on October 25, not far from the village of Agincourt. Henry´s men were exhausted, but even so he led them into battle, thoroughly defeating the French and gaining a victory which would be seen as Henry´s greatest, bringing the English closer to recovering lost French territory as well as Henry himself closer to the French throne. The battle however left the king with a dark shadow as he ordered all prisoners, even those of noble birth who normally would have been released for ransom, to be killed. This shadow became even stronger during his second campaign between 1417 and 1520 when he during the siege of Rouen let women and children starve to death. Arriving at the gates of Paris in August 1419 he eventually secured the Treaty of Troyes which recognized him as the heir to the French throne and not even a year after arriving in France, he married Catherine of Valois, daughter of the French king. During a third campaign to France, starting in March 1421 with the king sailing over in August that same year, his forces besieged and captured both Dreux and Meaux. 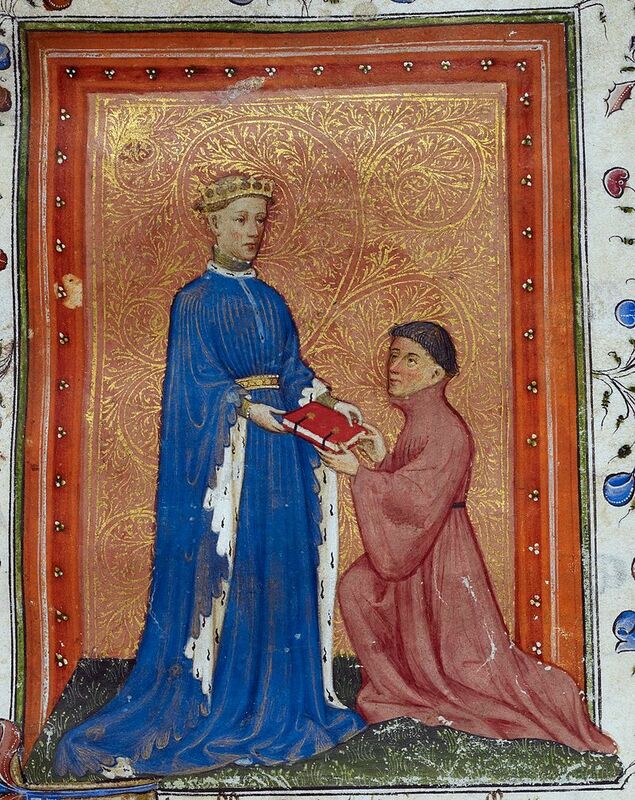 This would however be the last campaign for the warrior king who died from presumed dysentery on August 31, 1422, leaving behind an only 8 months old heir to the throne, Henry VI. John Bradmore´s account of the removal of the arrowhead is “borrowed” from the Medievalist.net website, and originally taken from a paper by Michael Livingstone, associate professor at The Citadel. 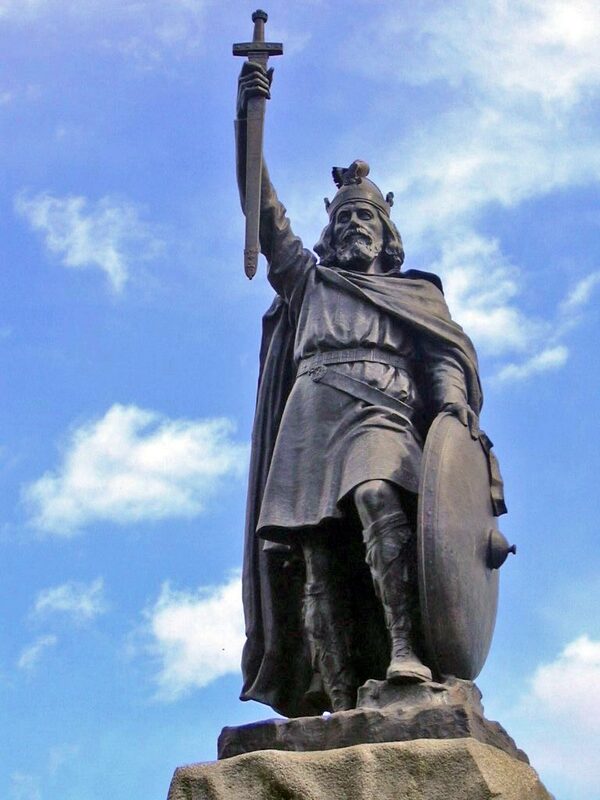 It´s not known when Guthrum was born, or how he acquired the power necessary to lead the Vikings under the Danelaw, but it is fairly certain that he arrived in England with the great Viking invasion in 865, and it´s absolutely certain that he gave Alfred the Great a run for his crown. 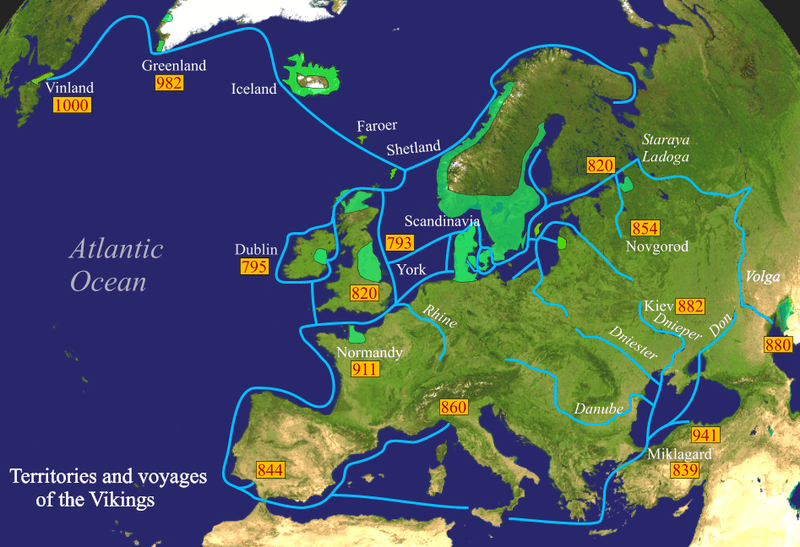 This invasion force came to be known as The Great Heathen Army in the Anglo-Saxon Chronicle of that same year, and was a consolidation of Viking warriors, probably mainly from Denmark, but also from Norway and Sweden, and was quite different from the previous “hit and run”-attacks on England performed by Vikings in that it lasted for 14 years. 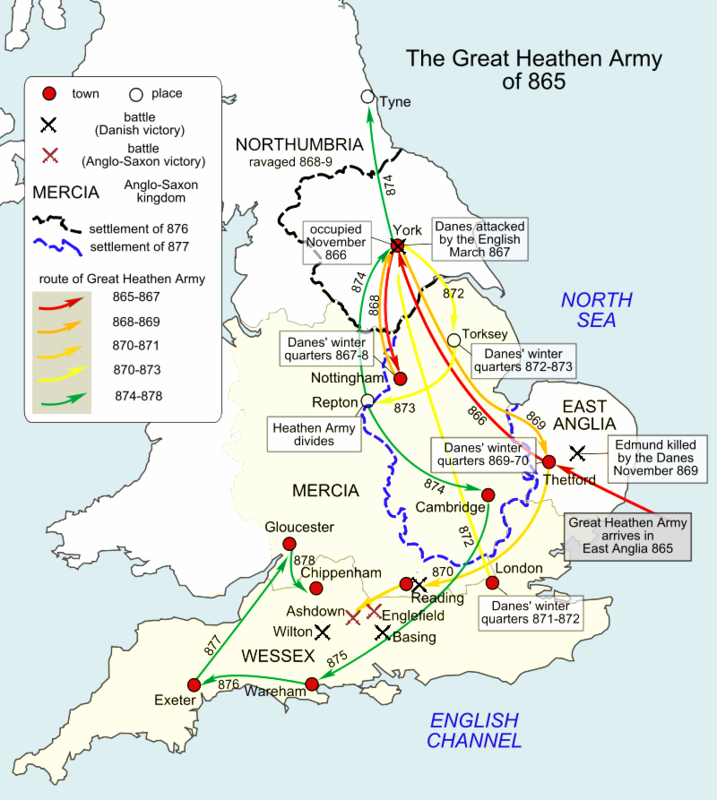 Ten years later, in 875, the Great Heathen Army split into two, with one part being led further north while the other part, under the command of Guthrum set up base in East Anglia, from where he only a year later had acquired parts of Mercia and Northumbria, with his sight set on Wessex, ruled by Alfred the Great with the first confrontation between them as a result. Sailing around Poole Harbour and linking up with another Viking army which was invading the area between the Frome and Piddle rivers, he defeated Alfred this first time, taking the castellum and the ancient square earthworks known as the Wareham. A peace settlement brokered by Alfred didn´t last long, because in 877 Guthrum´s army moved further into Wessex, with a series of confrontations between the two as a result, all won by Guthrum and his forces. The beginning of the end came on Epiphany, January 6, 878 Guthrum´s army launched a surprise attack on Alfred and his court at Chippenham in the middle of the night. To avoid capture Alfred fled into the marshes of Somerset with only a few retainers. Building up his forces over the months to come, he fought a guerilla war against the Vikings until the two forces eventually met for the Battle of Eddington in May 878. It´s not known how great the respective forces were, or how many that died on either side, it seems Guthrum´s forces may have been weakened by internal disputes as well as the loss of 120 ships in a storm in 876-77. After the battle, which Alfred eventually won, the remaining Viking forces fled to a fortress where they were besieged for two weeks before giving up due to lack of food. Guthrum negotiated the Treaty of Wedmore with Alfred, in which he agreed to be baptised as a Christian, adopting the name of Aethelstan and accepting Alfred as his Godfather. Guthrum respected the treaty for the remainder of his life, withdrawing his forces from the western borders of Wessex and retreated to the Kingdom of Guthrum in East Anglia where he died at an unknown age in 890. He was buried at Headleage, which is usually identified as Hadleigh in Suffolk. 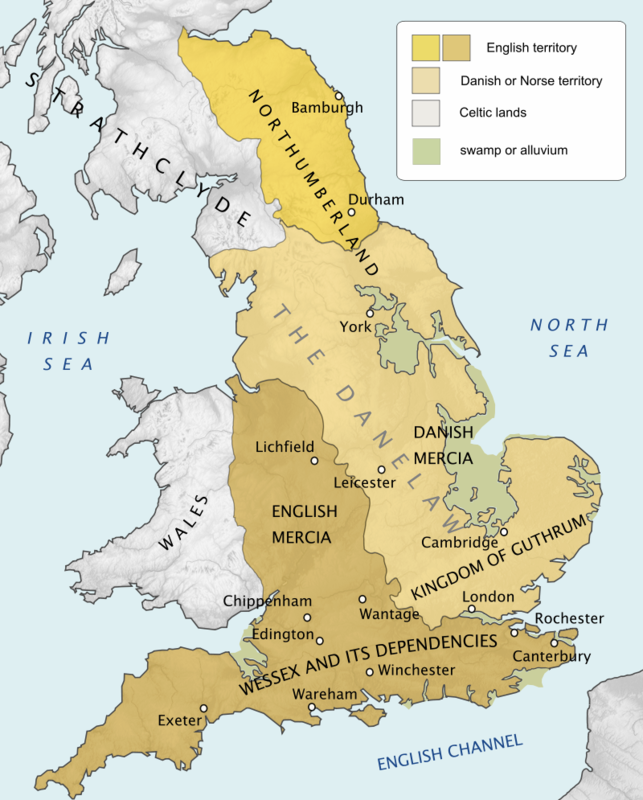 The Danelaw, as mentioned in Anglo-Saxon Chronicle, is the historical name of the part of England where the laws of the Danes, or Vikings, held sway over the Anglo-Saxon laws. While the name first came to describe the legal terms in the treaties drawn up between Alfred and Guthrum and formalised in 886, defining the boarders of their respective kingdoms as well as providing provisions for relations between the English and the Vikings. The term was first recorded in the early 11th century as Dena Lage. While first only describing the legal terms, it has come to include the area which was ruled under the Danelaw, compromising 14 shires: York, Nottingham, Derby, Lincoln, Essex, Cambridge, Suffolk, Norfolk, Northampton, Huntingdon, Bedford, Hertford, Middlesex and Buckingham. While the women of the poorer classes have been working since the beginning of time, “work” was not an option for women of the higher classes of society and in many cases the options were two: get married or join a convent. The fact that some women either by their own will or by the will of the family became nuns has sometimes inspired thinking in the terms of at what rate it was religious convictions that made people join a nunnery, but I feel that in using those words, we are beginning to apply our secular way of thinking to people living in an age when “not believing in God” was as unlikely an option as finding work was for an Earl´s daughter. This alone was not the reason for the number of daughters from the nobility choosing, or being expected to, to join a convent. Both Power and Barnes point out that doing so what not necessarily an undertaking done for free, something which is indicated already in the paying of a dowry by John of Gaunt to Barking Abbey for the admittance of Elizabeth Chaucer. Just as a wedding, the joining of the monastic life was a cost that often needed to be covered by, if possible, the bride´s family regardless of the groom was a man of flesh and blood or God. Another factor that speaks to the advantage for women of the nobility was that the woman wanting to become a nun was expected to have some level of education. Among the lower classes, the literacy among men was lower than 20 percent England in the 1550´s, and far lower among women. Literacy among women could be found among the gentry, the mercantile class and the nobility, which obviously in most cases excluded for example the thatcher´s daughter from a life as a nun. In 1527 they had seen Dorothy Barley, when she would have been around 37 years old, become elected abbess, a process that required a license from the patron of the order, in this case the king as Barking Abbey was a royal monastery and once that was achieved four scrutineers were chosen. Their task was to appoint candidates for the role as abbess and then the election would be held on a feast day. All nuns would cast their vote, and to be an eligible candidate the minimum requirement was that the nun in question was at least 21 years old, of legitimate birth and of good reputation. While her popularity among the other nuns no doubt played some part, and it has been suggested that the social standing of her family outside the monastery also played its part, what was most important was her merit and capability, or as expressed in the Benedictine Rule chapter 64 requires that a nun be chosen for wisdom and doctrine. As Abbess Dorothy Barley had her own household away from the rest of the nuns, and most likely it was also here that the children staying as wards lived. 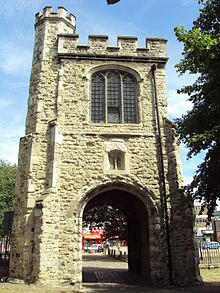 From 1437 to 1440 the two small boys Jasper and Edmund Tudor stayed here under the supervision of Katherine de la Pole, and in the last decade leading up to the surrender of the Abbey, Sir John Stanley dedicated his son to the care of the Abbess of Barking Abbey, where the boy would stay until the age of 12. Possibly was that the same John Stanley who was an illegitimate son of the Bishop of Ely, and if so, the boy in question would only have been four at the time he joined the Abbess of Barking Abbey. For the upbringing and education of the young boy, the abbess received £20 per year. 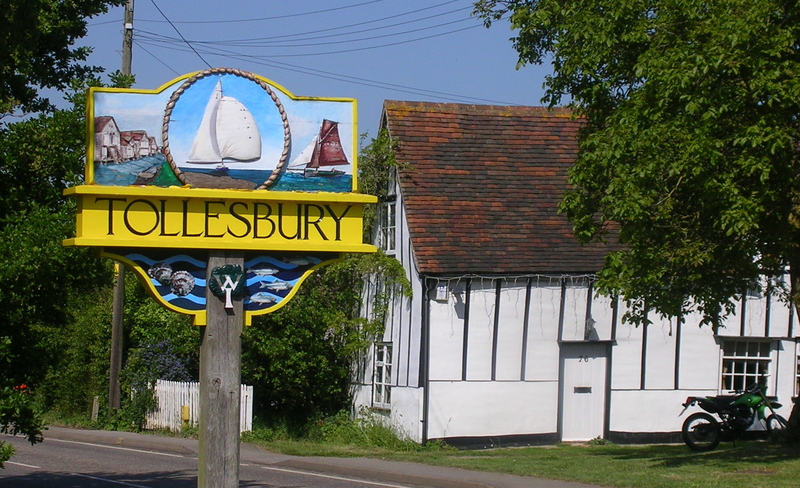 There are in some documents signs that other children may have been boarded in the household of the abbess, but unfortunately the names of their families does not remain. She, the abbess, would also have had the responsibility for both the financial and the judicial sides of the monastery. The financial matters included the administration of the abbeys funds, which derived from leases of demesne land of the 15 manors that was in the possession of the abbey, the lease for the mill in Barking as well as rents and taxes. Added to that there was an inflow of grain, produce, hay and wood from the manors. The ones belonging to Barking at the time of the dissolution was basically the same that hed belonged to the abbey since the 13th century: Barking, Abbes Hall, Bulphan, Caldecoates, Cokermouth, Down Hall, Great Warley, Hanley Hall, Hewkesbury, Highall, Hockley, Ingatestone, Leaden Roding, Mucking, Tollesbury, Wangey Hall, Westbury, Wigborough and Wood Barns. Both products and cash were used by the Obedentiaries, such as the Cellaress, the Sacrist and the Infirmaress, for the upkeep of the monastery and the sustenance of the nuns and those living in the monastery, not always just the nuns, which I will return to, it seems as if the different offices had their “own” manors from which they received the revenue to make the economy of their “department” go round financially. The abbess would also be involved in handle litigations, a not a too uncommon occurrence for the abbey as a major landholder with tenants. For these instances she had the assistance of stewards, two during the last years of the existence of Barking Abbey. They also were in employ of the monastery to keep an eye on the manors and lands belonging to the abbey, and from the 13th century it was common practice that these stewards had a legal education. 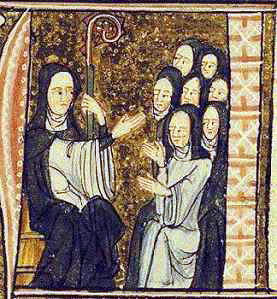 While the abbess in modern day terminology in many ways would have been seen as the public relations officer, spending most of her time dealing with the monastery´s contacts with the outside world – requiring her to be respected in a society run by men – she also had assistance by people who, to continue the modern day terminology, was in charge of the HR-department. This was the work of the prioress, second in command to the abbess and a position held in the last years of Barking Abbey by Thomasina Jenney who had been at the abbey since the late 15th century and up until 1508 had held the position as sacrist. In 1508 she was elected prioress, a position she held for the remainder of the abbey´s existence. She was assisted by a sub-prioress and due to the wealth and power of Barking Abbey, a third prioress, and their work was to oversee the work of the obedentiaries who all held different offices within the monastery. While the abbess was elected, the prioress and the obedentiaries were appointed, and this was a process that took place every year on the first Monday of Lent in the Charter House after Mass. The work of the nuns holding the offices during the previous year was evaluated by the abbess and those who had excelled at their tasks might be in for a promotion while those who had performed a less than satisfactory work could be demoted from their positions and return to the life of an ordinary nun. One example of promotion is that of Margaret Scrope who had been made precentrix in 1527, lady of the pension in 1535-36 and promoted to sub prioress some time before 1539. Another example of someone who had clearly managed her office very well is Thomasina Jenney who, as previously mentioned, held her office as prioress for 30 years. On this day positions which had become vacant due to for example the death of the previous holder was filled. A nun´s life: Barking Abbey in the late-medieval and early modern periods – Theresa L. Barnes, Portland State University, 2004. Barking Abbey: A study in its external and internal administration from the conquest to the dissolution – Winifred K. Sturman, University of London, 1961. Dugdale Monasticon, Vol 1, part 15: Charthe longynge to the Office of the Celeresse of the Monasterye of Barkinge. 1655.
Letters and Papers, Foreign and Domestic of Henry VIII, August-December 1539. Barking Abbey, London Borough of Barking and Dagenham, Museum and Heritage, Local History Resources. In the late 1530´s an era of over 1 000 years of monasticism in England went to its grave. For many of those who had spent their lives as monks, or as I will write about here, nuns, this was a surely earth shattering ending to a way of life one surely thought would last for the remainder of one´s life. For a long time throughout history, the life choices of women were basically restricted to either marriage, or if her family belonged to the nobility – or increasingly towards the end of monasticism – the upper gentry, or to the joining of a convent. In those convents, women could achieve something similar to freedom, but a freedom within restraints, the restraints of the order they had join itself. I have chosen to write about Barking Abbey, focusing on the women of living there during the last years before the surrendering of the abbey to the crown. Barking Abbey, founded around 666 in Essex by St. Erkenwald for his sister St. Ethelburga who was the first abbess there, was a royal monastery which originally housed both nuns and monks, but this would change during the Middle ages. As a royal monastery, the king originally had the right to choose the abbess, but after pressure from the pope, this changed during the reign of King John, and the nuns got the right to elect their abbess themselves. What remained was that at his accession, each king had the right to appoint a nun to the monastery. During the centuries prominent women had been holding the position as abbess, among whom can be mentioned three Maudes, the wife of Henry I, the wife of King Stephen and the daughter of Henry II. Henry II also used the position as a prioress at Barking Abbey for the reparation of the murder of Thomas Becket by appointing his sister Mary Becket. Here Edward II kept the wife of Robert the Bruce, Elizabeth, for a year before she was traded for English prisoners held in Scotland, and years later his grandson, John of Gaunt would pay the admission dowry to Barking Abbey for Elizabeth Chaucer, the daughter of his friend, the poet Geoffrey Chaucer. 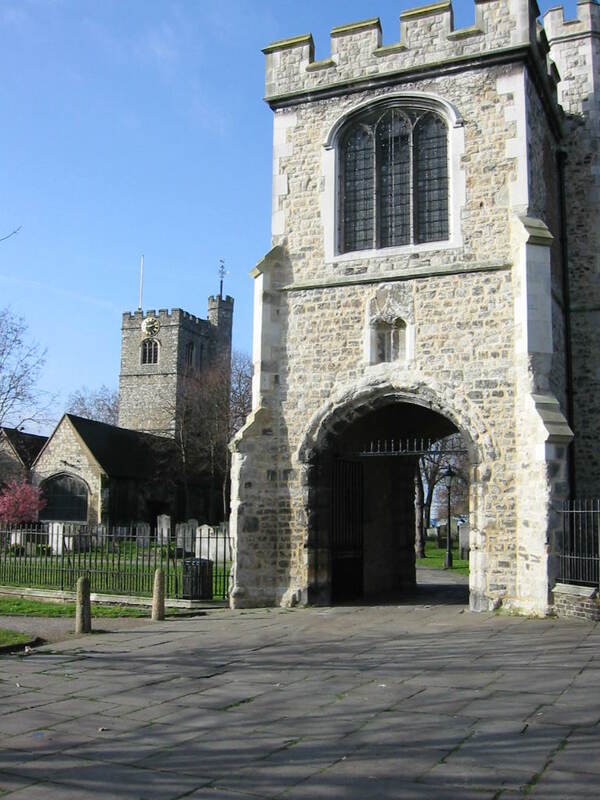 During the centuries, Barking Abbey remained one of the most powerful and rich abbey in the country, and the abbess here had precedence over all other abbesses in England. Had she been a man, she automatically would have had a place among the Lords in parliament and she was one of only four abbesses in the country who had baronial status, the others being the abbesses of Shaftsbury, Wilton and St Mary´s at Winchester. After a decision made by St. Dunstan, archbishop of Canterbury in the 10th century, Barking Abbey followed the Rule of St. Benedict. Out of the around 138 nunneries that existed in England between 1270 and 1536, more than half belonged to the Benedictine order. 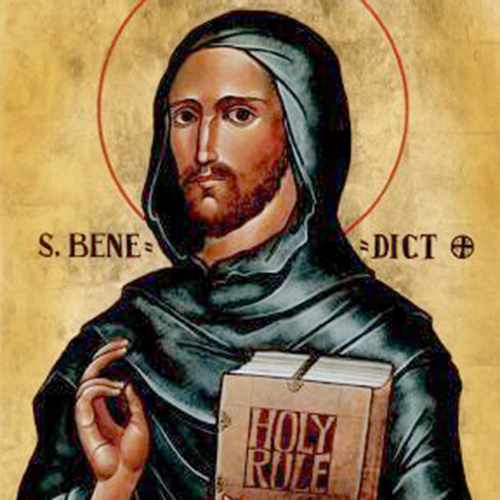 T he Benedictine order was, and is, an order which is more moderate than many other monastic orders and St. Benedict himself said in the prologue of his Rules, which the Benedictine nuns (and monks) follow that he intended to prescribe “nothing harsh, nothing burdensome” for his followers and instead his approach to seeking God has been seen as both sensible and humane. He also prescribed a balance between prayer and work, the Benedictines shouldn´t be so consumed by work that they forgot their spiritual responsibilities nor should they send so much time in prayer that their work was neglected. All things – eating, drinking, sleeping, reading, working and praying – should be done in moderation; “All things must be given its due, but only its due. There should be something of everything and not too much of anything”. The vows a Benedictine nun made when being professed was that of stability, fidelity (to the monastic way of life) and obedience. While “chastity” and “poverty” is mentioned in the Benedictine Rules, they are not the most important vows. At the time of the dissolution, Barking Abbey was the third wealthiest in England, with an income of around £1 084 per year, superseded only by Shaftsbury Abbey and Sion Abbey. 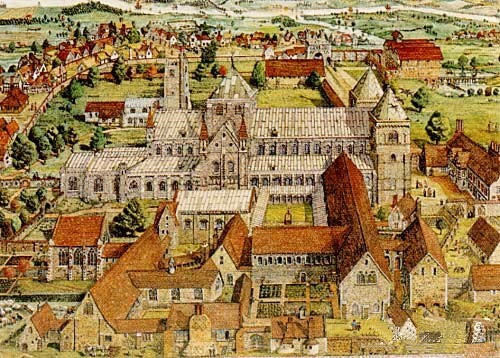 The 31 women who at the time of the surrender of Barking Abbey had chosen to take the vows and to live according to the Rules were Dorothy Barley abbess and professed around 1507, Thomasina Jenney, Margaret Scrope, Dorothy Fitzlewes, Agnes Townesend who had been professed in or shortly before 1499, at which time Margaret Cotton had been a novice. 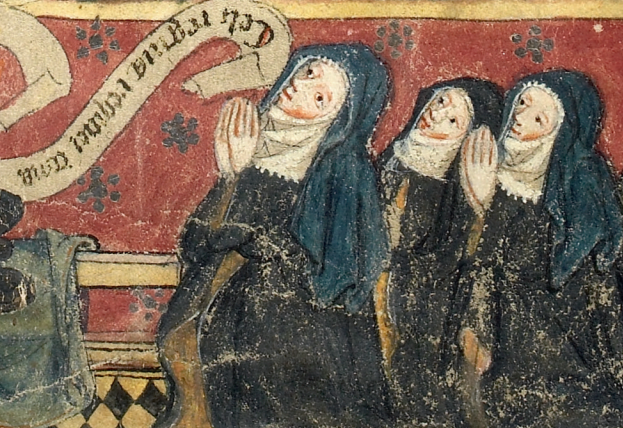 At the time of the election of Dorothy Barley for abbess in 1527, Gabriel Shelton, Margery Paston and Elizabeth Badock had been novices, to become professed nuns in 1534 together with Anne Snowe, Agnes Bukham, Margaret Bramstone, Elizabeth Bainbridge and Katherine Pollard, in a time when they no doubt they had thought they would survive the bath of steel and fire which would firstly would affect the smaller and poorer convents. The other nuns, with no information of when they had been professed to be found, was Joan Fynchham, Margery Ballard, Martha Fabyan, Ursula Wentworth, Joan Drurye, Elizabeth Wyatt, Agnes Horsey, Susanna Suliarde, Elizabeth Banbrik, Mary Tyrell, with Margaret Kempe, Elizabeth Prist, Audrey and Winifred Mordant, Alice Hyde, Lucy Long, Matilda Gravell and Margaret Grenehyll being the youngest. It is sometimes suggested that the option of joining the monastic life was something that was open to anyone, but this was not quite the case. Just as in arranging a marriage, a dowry would need to be provided, even though it was not officially allowed. This is illustrated not least in the earlier history of Barking Abbey, which seems to have been the nunnery of choice the upper classes. It is also demonstrated by the fact that the women at Barking Abbey whom it is possible to trace all belonged to nobility or upper gentry. 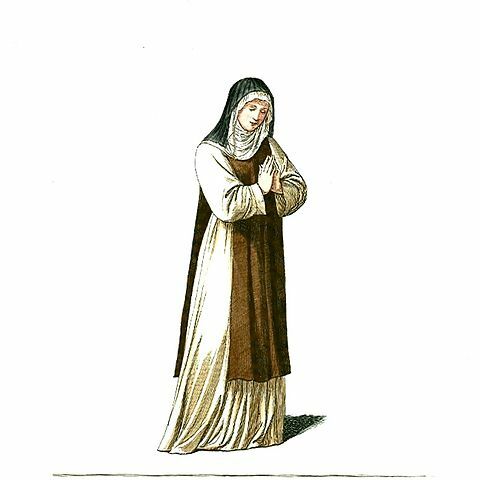 Those women whom it is possible to trace among the last nuns of Barking Abbey also demonstrates that it was the daughters of the upper layers of society who either chose or was made to join the monastery. Also during the last years, the names of the nuns where they too can be traced, confirm the assumption; Margery Paston was the daughter of Sir William Paston of Norfolk, Gabrielle Shelton daughter of Sir John and Lady Anne Shelton, the latter aunt of Anne Boleyn, to mention but two examples. I will elaborate more on Henry II at a later time, here just a sketchy portrait on the 862nd anniversary of his coronation, and a way to get back to blogging again. It´s been a long time off now! Today it´s 862 years since Henry Plantagnet – the first king to use that name which had been adopted by his father Geoffrey of Anjou – in 1154 was crowned at Westminster Abbey alongside his wife, the quite feisty Eleanor of Aquitaine. 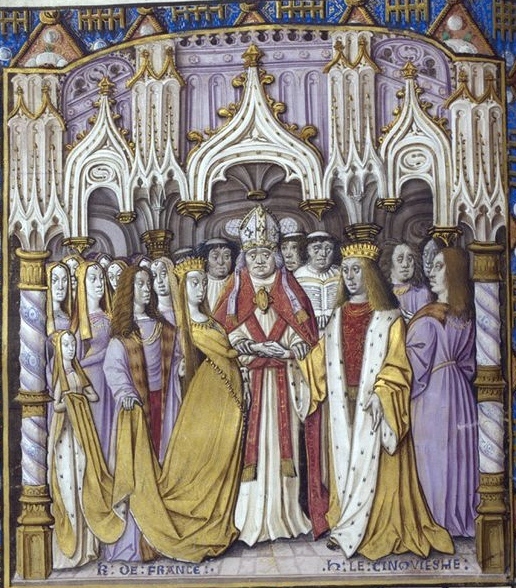 Henry was the son om Empress Matilda – or Lady of the English as she was also known during her own struggle for the English crown which unleashed the civil war known as The Anarchy on the English people, with her cousin Stephen of Blois on the opposite side of the battlefield – and Geoffrey ”the Fair”, count of Anjou. 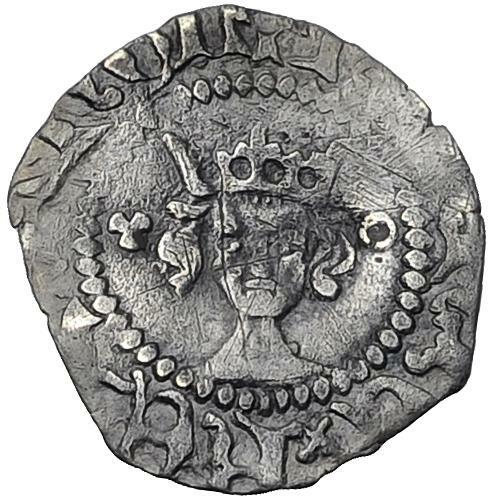 Just as his mother, daughter of Henry I and granddaughter of William the Conqueror, had a strong sense of birth right, and had a vast kingdom at the end of his reign, all of which he is said to have kept under control by constantly being in the saddle, riding back and forward through his domains. He would come to have eight children with Eleanor, and it is somewhat of an understatement to say that the harmony was sometimes lacking in the family. His son´s Henry, the heir to the throne and referred to as Henry the Young King, and his brothers Richard (known to history as Richard the Lionhearted) and Geoffrey would eventually rebel – with the backing of their mother – against their father. Henry was of course also the king who appointed his friend Thomas Becket as Archbishop of Canterbury, and caused his death through the allegedly misinterpreted words “Will someone rid me of this turbulent priest” once the friendship had turned sour. The conflicts with his son´s continued, and after having been defeated in a final rebellion in 1189, he shortly after died from what is believed to have been a bleeding ulcer. Henry II – New Interpretations: Nicholas Vincent, Christopher Harper- Bill. Henry II – W. L. Warren. I should probably say that I by no means have given up on this blog. I have just been swamped with work and studies lately, but will return shortly. When I was significantly younger, basically half of the age I have today, and went to Ireland with my best friend, there was a recurring joke among people we met to let out ”terrified” yelps or saying to something to the effect that they would go down fighting, both reactions caused by us being “Vikings”, and we happily played along, stating that we were back for some more plundering and pillage, as the vanguards clearly hadn´t quite gotten the job done. This post is however not about Ireland, or benign “Vikings” like myself and my friend, but about the time when it became obvious that Vikings was going to pose a serious threat to the British Isles in what is widely acknowledged as the first Viking attack in England and the start of the Viking era; the raid of Lindisfarne on June 8, in the year 793. It seems strange of course that the Anglo-Saxon Chronicle state the Vikings as arriving in January when it´s generally accepted that it took place in June, and the conditions for sailing the sea in the, for Vikings, traditional long ships would be more favourable, but according to Michael Swanton, historian, archaeological metallurgist, architectural historian specialising in Old English literature and the Anglo-Saxon period (among many other things), is an error in the original document. Also a Northumbrian scholar at Charlemagne´s court, Alcuin, was horrified: “Never before has such terror appeared in Britain as we have now suffered from a pagan race … The heathens poured out the blood of saints around the altar, and trampled on the bodies of saints in the temple of God, like dung in the streets”. The Vikings, or Northmen as they are called in the Anglo-Saxon Chronicle, or again, Danes, as they are often known was not necessarily of one nationality and most likely had no allegiance between the groups. “Danes” should not automatically be taken as people from Denmark (not least as none of the national states as we now know them existed at the time), but raiding Danes consisted of people from the countries around the Baltic sea, indeed what is now Denmark, but also Sweden and the areas which today form the Baltic states. 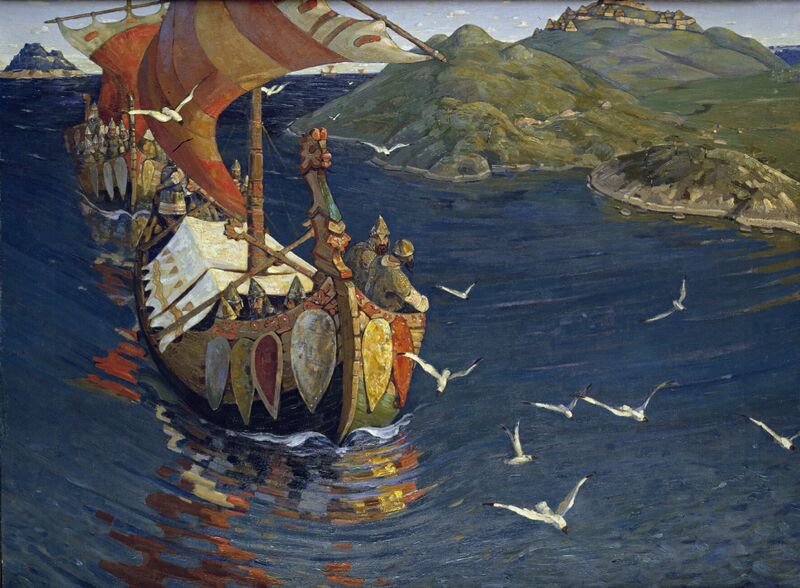 But back to what happened on that fateful day of June 8, 793; Lindisfarne was just outside the coast of the mainland, and not unlikely it was a surprise to the raiding Vikings that a wealthy monastery was located in such an isolated and vulnerable area. 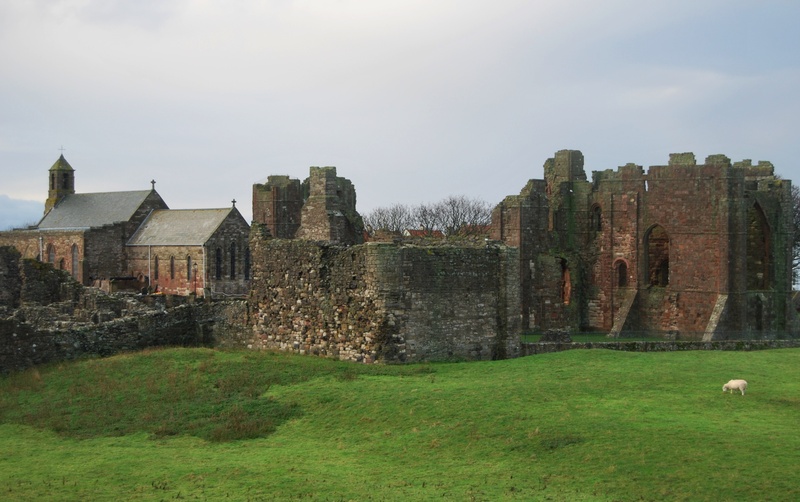 But Lindisfarne was also at the heart of the Northumbrian kingdom, and its monasteries was known for its books and arts. This may not have been objects valued by the Vikings, as books was not a commodity known to the people of the north. Not that they didn´t record their stories – even though many of them went on through oral tradition – we still find the tales of particularly worthy people carved into stones, the special Scandinavian runes. Plundering, burning and killing the monks inhabiting the monastery of Lindisfarne, as well as terrifying everyone that managed to stay alive, the Viking was seen by representatives of the church sent by God, punishing the people struck down by the violent men from the north, something which maybe can be seen as slightly ironic, as the church and its wealth would continue to draw the Vikings attention in the years to come. After the attack on Lindisfarne, the previously mentioned Alcuin who himself was a monk as most scholars of the time, took the opportunity to write to the Northumbrian king Ethelred as well as the Bishop of Lindisfarne where he urged them to, in the future “consider the dress, the way of wearing the hair, the luxurious habits of the princes and people”, just in case “this unaccustomed and unheard-of evil was merited by some unheard-of evil practice…” One can only say that victim blaming clearly isn´t a modern phenomenon. 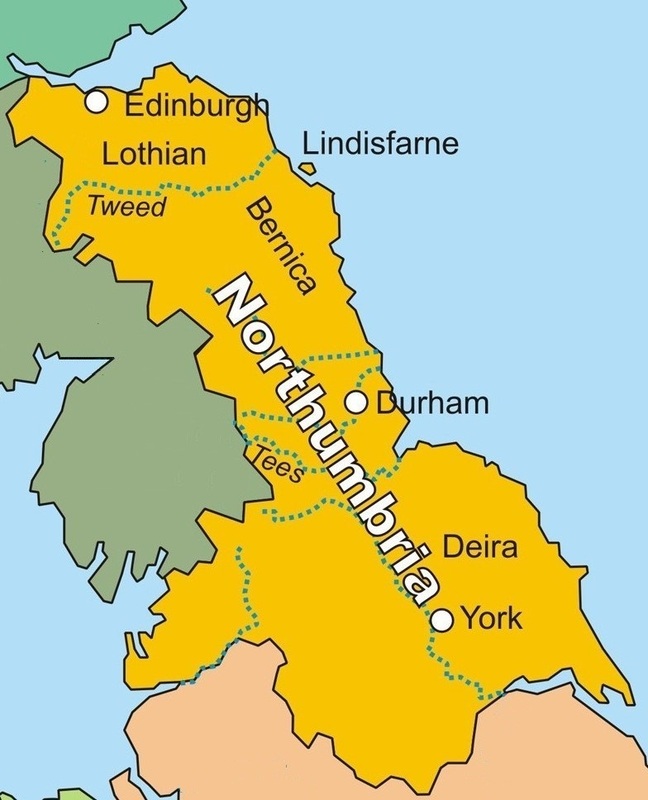 The monastery of Lindisfarne did recover from this attack, but the raids would continue, all over England as well as Scotland – where Iona was attacked in 794, 802, 806 and 825. In the unlikely event Alcuin was on to something in his accusations, the monastery of St Columba had really aggravated God.